Alberto works during the summer at Papa’s Freezeria on the beautiful beaches of Calypso Island. 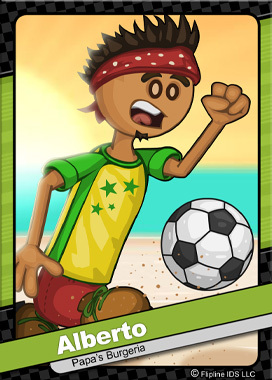 Being an avid football fan, he helped organized the island first amateur Beach Soccer League. On the weekends, Alberto co-captains the Freezeria Swizzlers with his girlfriend, Penny. Although they haven’t won many games, they still have a great time together.